The Sandown property is the site of a 95 acre former horse racetrack and associated accessory uses. Discussions regarding the Sandown site began in 2010. The current Sandown project was first introduced to Council in 2011, when the owners of the Sandown Racetrack declared that the existing operations were no longer economically viable and they expressed interest in applying to rezone the lands. The proposal involved the exclusion and rezoning of 12 acres of the site at the Glamorgan and McDonald Park road intersection to commercial uses (Sandown Commercial (C-5)). 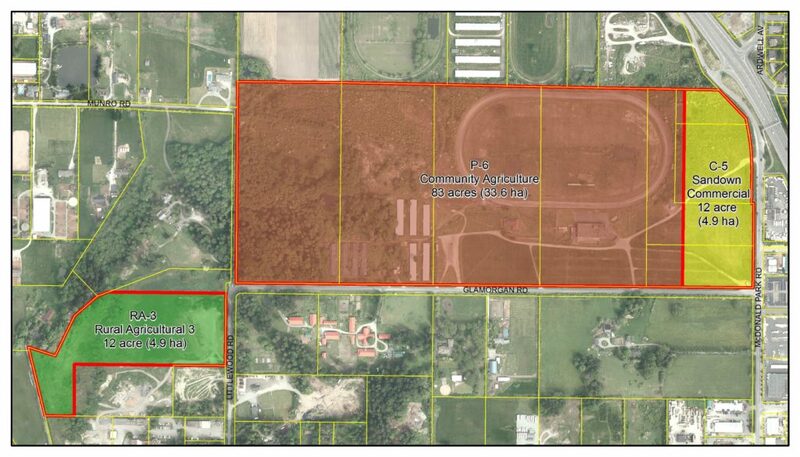 The remaining 83 acres of the site was to be rezoned and transferred to the District for various agricultural related purposes (Sandown Community Agriculture (P-6)). In order to ensure no net loss of land in the ALR, the District offered to include 12.05 acres of municipal land into the ALR. In November 2011, the Agricultural Land Commission (ALC) granted conditional approval; to the exclusion/inclusion application. A key condition required by the ALC was the development and implementation of a site drainage and agricultural reclamation plan. In 2014 Council adopted the OCP amendment bylaw and a bylaw to enter into a Phased Development Agreement with the property owners. Subsequently, in November 2014, Council adopted the bylaw to rezone the property. Over 2015 and 2016, the District engaged the Capital Region Food and Agriculture Initiatives Roundtable (CRFAIR) to consult with the local community on their vision and priorities for the 83 acres (33 ha) of Sandown lands proposed to remain in the ALR. The 2016 CRFAIR report, Vision Sandown: What We Heard, summarized engagement with over 500 community members and provided a vision and insight into community values related to future use of the lands, and next steps to guide development of the lands into a community agriculture resource. In the fall of 2017 the ALC approved the Agricultural Reclamation and Drainage Plan for the site. Subsequently, subdivision approval was granted creating 3 new parcels, which make up the 12 acre commercial site and the 83 acre remainder as the agricultural parcel. The transfer of the 83 acres to District ownership and the inclusion of the District’s own 12.05 acre adjacent parcel to the west, and the exclusions of the 12 acre commercial portion was complete. Following the Vision Sandown process, Council awarded to contact CRFAIR in 2018 to work alongside the Sandown Transition Team (STT) to create a transition plan for the Sandown Community Farm. The transition plan includes multiple productive farming options, from incubator plots to medium scale operation; recommend governance and revenue options, and the necessary assets to support and enhance food production in our region. The overarching goal is to create a community farm that actively contributes to our local food security, engages the community in local food systems, offers teaching and learning, and showcases the diverse onsite ecosystems. Council received the staff report dated October 17, 2018 for information which included the STT documents. Council requested that staff bring forward options for short-term basic maintenance and short-term land use of the property. Council also requested that staff report back with advice for the long term use of the property and a request for Expressions of Interest. No land use decisions have been made for the Sandown property. Work to reclaim the site to general agricultural status as required by the ALC, is underway and is substantially complete as of March 2019. Photos are available of Sandown aerial maps 1946 – 2013 as well as the stable and grandstand demolition photos.